If there is one thing very constant about me, is the fact that I don't smile with my teeth. Ever. I am very conscious about how it looks. Don't get me wrong, dentists tell me my teeth is perfect every year. I get periodic scaling and polishing done every six months. I have never had fillings done to my teeth. At least the ones that looks metallic. Technically, I should have no issues with the way my teeth looks. But I do. I believe my teeth is horribly stained. Every two years, I will purchase bleaching strips and use a minimum of five to achieve my desired shade of 'whiteness'. This time, I wanted to skip the bleaching strips altogether and try something less harsh. Imagine my delight when La Vie Aesthetics contacted me and asked if I wanted to have a go at the Sparkle Smile Teeth Whitening Treatment. Conveniently located at Orchard Gateway, the centre boosts an elegant and cozy interior. One can't help but feel like a princess waiting to be pampered. During consultation, we measured the original shade of my upper, bottom and side teeth. I was informed that most of the time, our bottom and side teeth are more stained than the upper. With the side teeth being more stained because it is the first to bite into foods. My upper teeth was measured at S18 (photo below) before treatment. After consultation, I was brought into the treatment room. The treatment room, although small, feels very cozy. Especially with the given blanket as it can get quite cold. I brushed my teeth and wondered how can anyone every look glamourous brushing their teeth because I don't. Lip protector was first applied before the whole treatment begins. After which, gum protector was applied to the gums nearest to the teeth being treated. 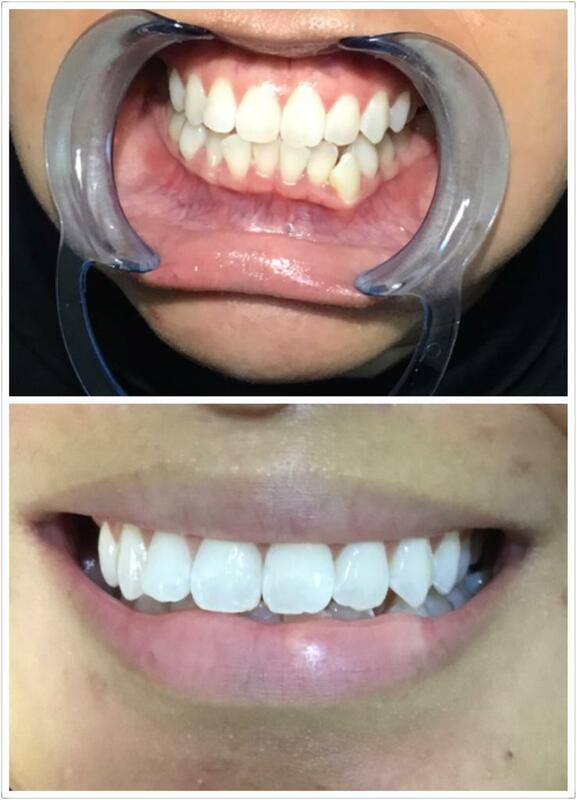 After the whitening gel was applied, the therapist used the blue LED lights to start the whitening process. This is where is gets ever so slightly uncomfortable for me. The room was in total darkness. I can't exactly move freely because I feared that if I moved a little, it will affect the 'whiteness' of my teeth. I get a little claustrophobic especially since the room is so silent except for a beeping sound every minute. So I counted till fifteen and thankfully the therapist came in soon after. I was very hopeful and excited to see the results. So after they removed everything from my teeth and brushing it clean, my therapist wanted to take a photo for the 'after' shot. "Oh my. Your teeth is so white! It is so white that I am struggling to take a photo because it is reflecting light." Can you imagine my happiness when I heard that? So let me reveal to you the before and after photo. MY TEETH IS REALLY WHITE. My upper teeth went from S18 to S8 in just one session. The first three shades, S2 to S6, are veneer shades. Essentially, natural teeth would be impossible to reach the veneer whites. My upper teeth is at the shade just before it. My therapist actually said we may get my teeth in the veneer white. Lucky for me, I don't drink coffee or tea. I don't smoke. These are the main causes of teeth being stained. Teeth whitening is not a permanent solution to pearly whites. Effects can last up to two months or more if you go for regular treatments and take good care of your teeth. I still have a few more sessions to go so I can't wait to update you how white my teeth can get. See you in a few months with an even whiter teeth! Click below to be directed to La Vie Aesthetics page and register for a trial session at $168.